Book a combination of five nights between Ebony and Sweni Lodge and receive one of the nights and one flight per person between the lodges complimentary. * This product is priced in South Africa Rand (ZAR), AUD rates can fluctuate depending on exchange rates, final rates in AUD will be confirmed by your consultant at time of booking. A minimum of five nights is required. For information regarding rates, please refer to the rates table below. *A minimum stay of five nights is required. Please speak to one of our Travel Specialists for more details. Children aged 10 years and older are welcome at Singita Lebombo Lodge. Children of all ages are welcome at Singita Sweni Lodge. A single supplement will apply if three or more single rooms are booked in a reservation. A supplement of 25% of the adult rate will be added from the third single room onwards. Singita Lebombo & Sweni Lodges may be accessed by private air charter directly to the lodge or on the scheduled air services on Federal Air. Flights to the lodge can only be operated during daylight hours. Restrictions apply. Federal Air transfer tariffs are valid 01Jan–31Dec and are subject to change. PLEASE NOTE: Due to the increasing fuel cost, Federal Air may increase their fuel surcharge during the year, in which case the incremental cost must be borne by the client. 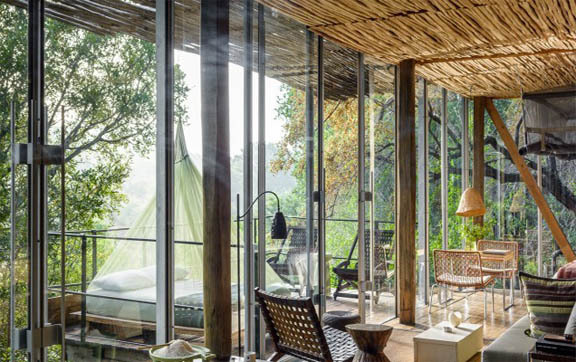 Singita will not be accountable for any such fluctuations beyond its control. Sweni Lodge was influenced by the structures of dens, warrens, and lairs found in the area. Flanking the Sweni River, this tranquil sanctuary is elevated on stilts with decks of timber. Even when you’re indoors, you’ll have the sensation of being close to the river and trees. 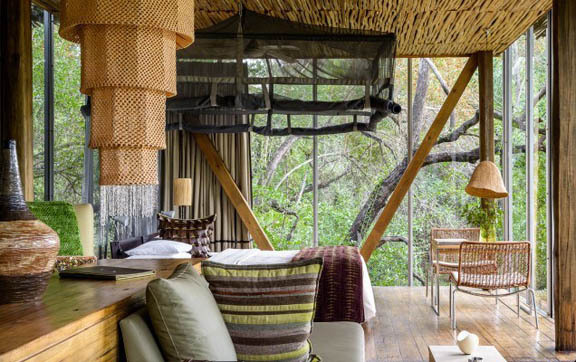 The six secluded suites, with tactile furnishings, have been carefully created to bring in the textures and shades of the bush. Designed with open-plan living in mind, your suite flows from the bathroom area, through to the lounge and into the bedroom – yet if you wish, each area may be sealed off by curtains. Try the outdoor shower overlooking the river or – for a magical experience ‘camp out’ under the stars on the day bed out on your viewing deck. Singita Kruger National Park is found on the southeastern reaches of the Kruger National Park, on South Africa’s border with Mozambique. Situated on 33,000 acres, this exclusive concession is one of the most incredible territories in the park and is home to exquisite selections of flora and fauna in four different eco-zones. This is where you will find Singita Sweni Lodge. Private aircraft pilots land at their own risk, runway information available on request. Landing with prior permission only. Please note that only a small number of companies have permission to land at the Satara airstrip as it is run by the National Parks Board. All charters are to be aware of the operating guidelines for pilots in the park and are to obtain prior permission before landing. During your stay at Singita Sweni Lodge, you are likely to spot a great variety of wildlife including elephant, leopard, famously large pride of lion, white rhino, black rhino, buffalo, hippopotamus, cheetah and sable. Singita Sweni Lodge is in a malarial zone so it is essential to consider taking appropriate prophylactics. It is also recommended that you consult your doctor/physician before travelling.